^ watch a short video with co-creator, Charlie Cannon, explaining the pathways model and its application. The Winterhouse Institute Social Design Pathways is a model developed collectively by nearly 20 leading social impact design educators at the 2013 Winterhouse Symposium. The Pathways provides a clear and powerful framework for social impact design educators, students and practitioners to map out the resources and range of expertise required when addressing complex social problems at various levels and scales. Range of Expertise (x-axis): refers to the collections of expertise brought to bear on a problem — an individual designer, an interdisciplinary team, or a cross-sectoral collective. Scale of Engagement (y-axis): describes the level and scale at which the design intervention aims to make change happen — at a project, system and/or cultural level. The Social Design Pathways is a powerful model for educators and students to map out issue-based problems in order to understand how they might be addressed at multiple levels, how problems can be framed from a variety of perspectives, and how interventions can be designed to engage a variety of actors to achieve different levels of change. Each quadrant also requires different fundamental skills for designers to be prepared to engage effectively. 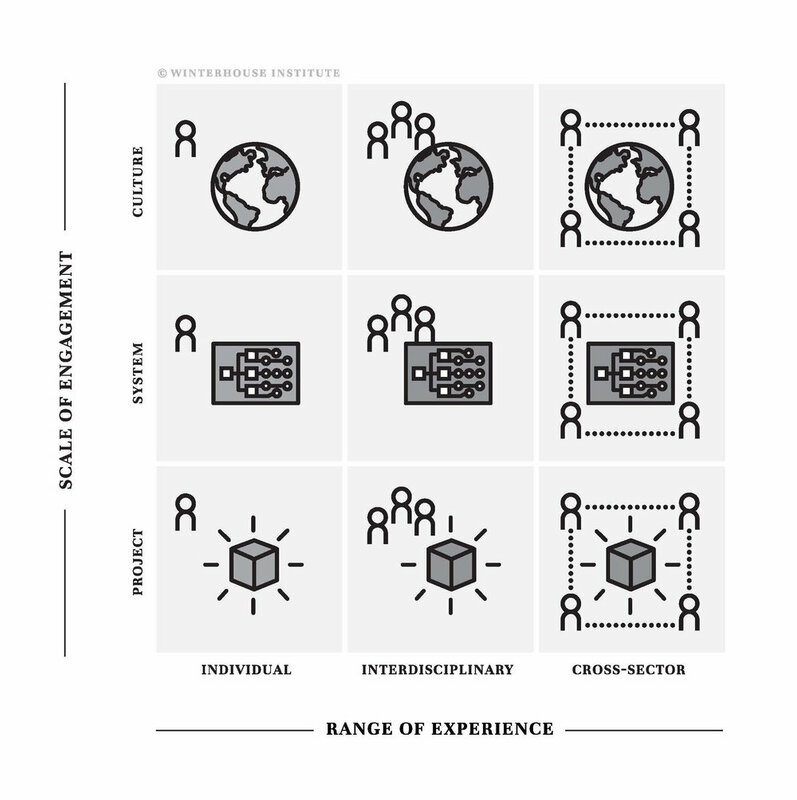 Projects and interventions oftentimes extend across multiple quadrants, requiring a mix of experience, expertise and skills. Since its release in 2013, the Winterhouse Institute Social Design Pathways has been shared widely and integrated into many impact projects, global workshops and course curricula. The Pathways model is licensed under a Creative Commons Attribution 3.0 Unported License. In plain English, you can use it in any way you wish, as long as you attribute it to the Winterhouse Institute and share any alterations or use of the Pathways by emailing us here.